Not Sure About How to Arrange a Party, a Hall or a Magician? "When you want a magic show you need to hire a professional magician." "When you want a mini disco, you need a proper mini disco." Christian P Taylor is a Professional Entertainer and will show you how to have an amazing Birthday Party, that will Amaze your Child, Their Friends, The other kids Parents and in some cases, Save You Money! How Will Hiring a Professional Kid's Magician Help You? When you Hire Birthday Party Magician Chrisptee to entertain the Children and the Parents at your Party, you can be sure that all you need to do it provide the food, drinks and cake. K.I.S.S - Keep It Simple Stupid (That's me by the way) Chrisptee will entertain the Children from the second they walk through the door until it's time to go. Depending on age, the majority of the kids will join in right away. Some children may be a little shy and cling to their mums. But when they see all the other kids having fun and especially when mums get up and join in, they will too. Everyone is occupied. Everyone is joining in. So You don't need to spend a fortune on decorations, that you'll throw away afterwards. Book far enough in advance (8-12 weeks), you can usually get the best Hall/Venue for your needs at the best price. Most parents wait until it's 4-6 weeks and then struggle to get the venue. Leave it 2-4 weeks and you're going to struggle to get the Venue and the Entertainer. How soon do I Book? Always make sure the Entertainer you want is available before you hire the hall, then book the entertainer right away. 8-12 Weeks Guarantees you the entertainer, the venue and the time. DON'T PANIC if it's less than 4 weeks, just call me, I will help you out. Halls and Venue Costs Vary, as do their Facilities. Here is a Huge list of Bristol Halls for Hire, it also has a Map that you can zoom in and find venues close to you. Week Day Stress Free Party's are a Great Alternative to Weekends. 4.30pm to 6pm is a wonderful time and Very Popular. How Much to Pay for Entertainment? You can pay a lot for a Child's Party Entertainer, it all depends on what is included. Some performers go all out on Costumes, Props, Electronic Wizardry, Prizes, Fancy Vans with Amazing Artwork, Expensive Advertising and only perform One show a day. It also depends on How Far they have to travel. A local entertainer is Always cheaper than someone who has to travel miles to get to you. But, if you want a certain entertainer and they have to travel, you must be prepared to pay more. 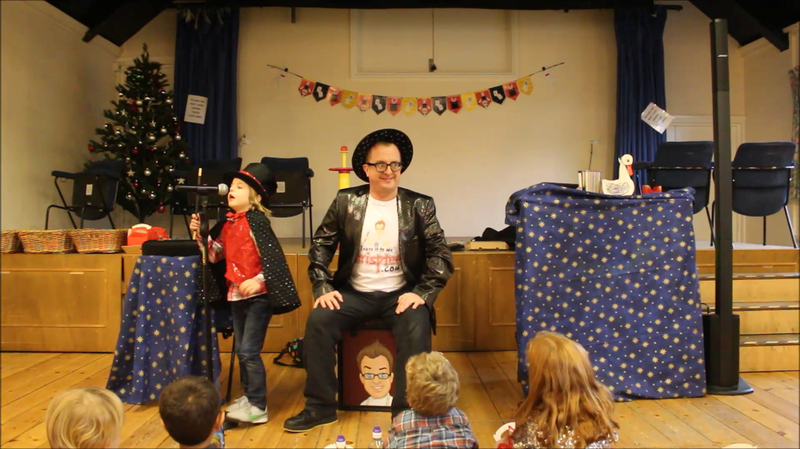 The Chris P Tee Magic Mini Disco is a 2 hour Mini Disco and Comedy Magic Show that the kids love and the parents enjoy too. ​A stress free party that is Memorable for All the right reasons. To look good, after all, you did all the hard work organizing the party, You get the Credit. A Full HD Video of Your Child Performing with Chris P Tee (When Possible). Do I Really Need to Do a Party? Sometimes, it's easy to forget just how important a party is for Children. They grow up very fast and you only have a short time frame before they want to do other things. Plus, Many people know they want to Hire a Professional Children's Magican like Chris P Tee, Months in Advance. So you really have to get in there before they book him as there are only 4 weekends every month and the times available can book up REALLY QUICKLY. From the ages 1-2, the party is for you and relatives and other children to enjoy. You can do this at home and there really isn't any need for an entertainer. Unless it's a Celebration, a Family Gathering, then why not. Just give me a call and I can help. From ages 3yrs to 9yrs the Birthday party is so special and important to Children, it will stay in their memories for a lifetime. These are the Best Ages for a Birthday Party in my humble opinion. From ages 10-13 the birthday party has to be Cool. They want a proper Disco, where they can dance and socialise. The parents rarely stay and all the kids are left to their own devices. With me, you can be sure that you don't have to worry what to do with them all. I'll have them dancing and begging for the magic show. Which they will love, as I will perform more grown up magic that will have them gasping with amazement. From 14 they want a proper Ibiza Nightclub Disco, Stretched Limo and Dynamo Magician to come to their party. Good Luck! If you need help or advice, Call me.